That’s where we have sensory schemas and motor schemas. This is where the system is in touch with the external world though perception (sensory schemas) and action (motor schemas). Basic schemas are represented in the systemic degree, which is roughly comparable to a cognitive dictionary. Sensory concepts are localized in space and time in the episodic degree, where they are also organized into extended stories – a history. 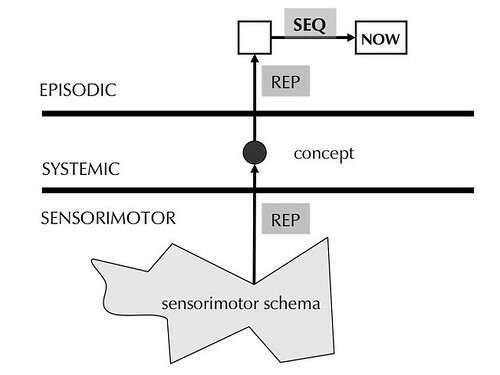 In the diagram we have a sensorimotor schema for, say, an apple, which is represented (REP) in cognition by the conceptual apple. The SEQ arc is a sequence arc; this one locates the apple in the past with respect to the here-and-now. What’s important is that these degrees are ordered. Objects in lower degrees can be represented in structures in higher degrees, but not vice versa. This ordering would be given in the physical structure of the brain. That’s how the wiring goes. 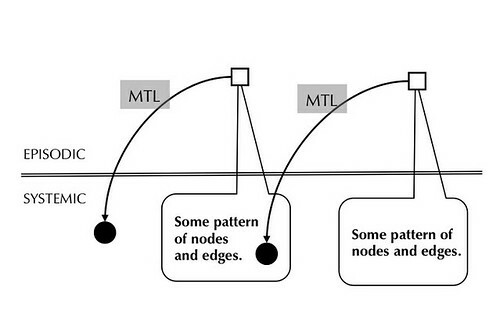 Representation (REP) arcs thus are all directed from nodes that a physically low to nodes that are higher. For the purposes of this post I’m simply making that as a flat assertion without any neuroanatomical or function evidence. Such evidence is obviously necessary. Hays and I have presented some of that evidence in a rather general form in The Principles and Development of Natural Intelligence, though we didn’t address this specific construction. This ordering as the effect of logical typing. Objects at different degrees are strictly limited in the ways they can interact and the notion that one degree is higher than another has logical, and not merely physical, import. There is one exception, however, to the ordering of concepts within in degrees. That is the metalingual (MTL) arc, which can link episodic structures to single systemic nodes, thus giving a sense to that node. Metalingual arcs are directed from nodes that are high in the system in a physical sense, to nodes that are low. The episode at the left represents the assertion that Mrs. Poyser said something. 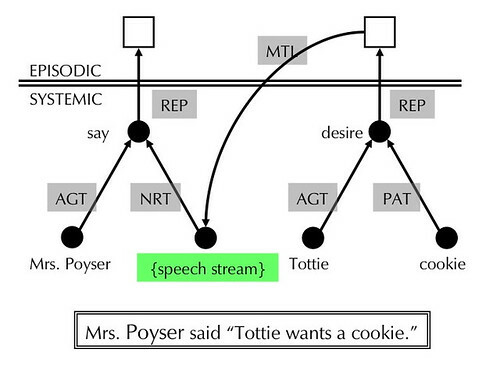 The systemic node that is the object of Mrs. Poyser’s speaking is simply the speech stream, which is also a sound like any other sound and can be perceived as such. The episode at the right represents the assertion that is the content of Mrs. Poyser’s utterance. It is linked to that utterance by a metalingual arc. 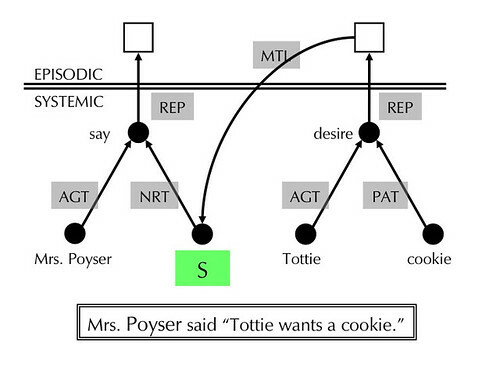 The next diagram is identical to the previous one except that I’ve changed the label on the node that represents the object of Mrs. Poyser’s speech act. I’ve now labeled it “S”, Chomsky’s S if you will, though you shouldn’t take it too literaly. It’s a hint, a conceptual provocation. That is a recursive step. And it is a property of the whole system – semantics, syntax, phonology and phonetics – and not of some modular component of the system. From there it’s a matter of bootstrapping of internalizing and “compacting” the recursive operation. The point is simply that such a possibility is there. The exact process, of course, needs to be accounted for. One might begin by thinking of Vygotsky’s account of language development and the emergence of inner speech as the internalization of one’s conversational other in the speech situation. This account does not require that recursive capacity be genetically or physiologically specified in any direct way. All that is required is 1) that the nervous system be organized in a way that has the effect of logical typing, 2) that speech (or gesture, for that matter) be an object of perception like any other sound (or sight in the case of gesture). Under this account it would be possible for a people to have speech without any recursive syntactic capacity. But in time it would be possible to bootstrap that capacity in to the system. Bootstrapping in program development began during the 1950s when each program was constructed on paper in decimal code or in binary code, bit by bit (1s and 0s), because there was no high-level computer language, no compiler, no assembler, and no linker. A tiny assembler program was hand-coded for a new computer (for example the IBM 650) which converted a few instructions into binary or decimal code: A1. This simple assembler program was then rewritten in its just-defined assembly language but with extensions that would enable the use of some additional mnemonics for more complex operation codes. The enhanced assembler’s source program was then assembled by its predecessor’s executable (A1) into binary or decimal code to give A2, and the cycle repeated (now with those enhancements available), until the entire instruction set was coded, branch addresses were automatically calculated, and other conveniences (such as conditional assembly, macros, optimisations, etc.) established. 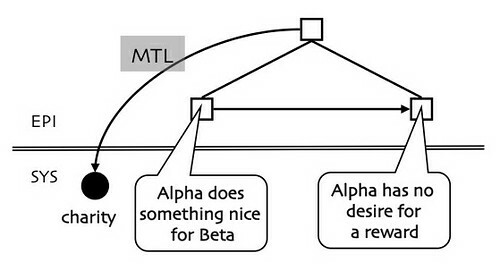 This was how the early assembly program SOAP (Symbolic Optimal Assembly Program) was developed. Compilers, linkers, loaders, and utilities were then coded in assembly language, further continuing the bootstrapping process of developing complex software systems by using simpler software.